Earn $1.49 in Podium Club credit. Click to Learn More. Simple and light. Uses threaded CO2 cartridges (Includes one 16g cartridge). Re-designed to more easily accommodate disc wheels. Presta or Schrader valve compatible. Quick,Simple & Small.Great product with minimal size !!! I have three of these for different bikes.Best inflator on market ! 0 of 4 customers found this review helpful. I haven't used the Inflator yet. It's there in lieu of a pump in case I need it. Small in size! Fits anywhere! We initially intended to use this product as a topping-off tool only, but realized early-on that this would not be too feasible for us. It requires two hands to operate one hand holds the tool firmly over the tire's air valve (will fit Schrader and Presta valves), while the other hand unscrews the cartridge from the Microflate Nano to let the air out of the cartridge (through the inflator tool) into the tire. Having both hands busy while filling feels clumsy and one has to first twist the cartridge closed before letting go of that same hand in order to feel the tire's inflation as one continues with the fill. 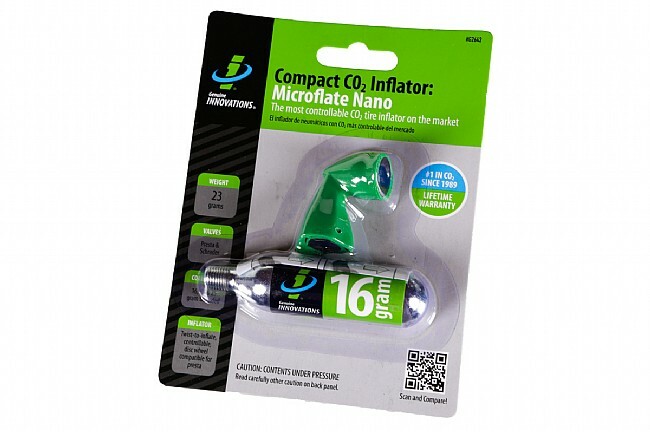 It's a clumsy fill but the Genuine Innovations Microflate Nano CO2 Inflator will surely get the job done, regardless! Given this inconvenience, we now use only when we intend to completely fill a tire, and not when we just need to top-off. This is the easy to use system to fill tires tubes after you flat. Very easy to use and attaches to many water cage systems for Tri Bikes, so storage and carrying are easy. I've been using the Nano CO2 inflator for several years now in all my long rides & Ironman races. It's durable & simple to use. Simply the best CO2 Inflator! I think that the Genuine Innovations Microflate Nano CO2 Inflator is the simplest and easiest to use inflator on the market. I have tried many brands and types of inflators and there are no others that I like better. The Nano is so compact and tiny that it easily fits in my back jersey pocket, in a plastic bag with a couple of 16g threaded cartridges, tire irons and fresh tube, you hardly know it is there until you need it. The Nano has very accurate metal to metal threading to the valve and to the cartridge so that makes its use simple and convenient to use and control air flow. When I have a flat, it takes me about 2 minutes to change with my Nano, 16g threaded cartridge, tire iron and fresh tube (always remember to inspect for holes and puncture material inside and outside the tire after removal of the old tube and to pre-inflate the fresh tube by breathe and then close the presta valve stem so that it does not lose air before dropping the tube into the tire cavity(this helps prevent pinching of the tube between the tire and the rim bead)). I know that I can pump a presta valved 700x23c to approximately 110 psi with one cartridge. But with the Nano, I can easily start the pressurization and check for tube pinches exposed on the tire or bead seating before fully inflating the tire with no loss of air from the inflator. The Nano design makes control of air flow easy and keep your friends from impatiently waiting a long time while you change your flat (that is if they do wait for you at all)! I use it when I get a flat. Don't like how the CO2 release is hard to control.Like the ultraflate much better. I did like the small size in my saddlebag. I think this is the easiest and best Inflator out there. You control the flow by simply twisting the cartridge. You place the nozzle over the stem and slowly twist the cartridge to release the co2. Other units are either all on or all off so if you make a mistake you blow out all the co2 in a flash. With this model you can do it slowly to make sure you get it right. I use this inflator to get myself back on the road after a flat...the inflator definitely meet my needs, more practical then a pump for a road rider, I recomend it! Lighter, quicker, more compact than a pump. Works well enough..usually fills a 700x23 tire to 90psi plus or minus...enough to finish the ride andor get you home. Tiny and Easy to use. I bought this inflator to use with 16g threaded CO2. I now have two of them. 10 of 13 customers found this review helpful. I started out really loving this inflator. Simple, small, and it works. What's not to love, right? Then one time I had to use it and it turns out that some washer-like thing had been slowly loosening itself over the months. When I went to inflate the washer came loose, along with a gasket, and shot off the inflator, propelled by the CO2. Luckily I found the parts in the dirt. Sorry but I don't want to worry about whether my inflator is going to fall apart on me in the middle of nowhere. I have since switched to the Planet Bike Air Kiss, which is cheaper and more reliable. 62 of 62 customers found this review helpful. I don't know why people by the more expensive and significantly larger inflators. This is really easy to use. Just screw the cartridge in all the way to puncture the cap. Put the inflator on your valve, and slowly unscrew the cartridge. This lets the CO2 flow into your tire. If you want to stop the flow, just screw the cartridge back in. It's as easy as that.